Whether you're interested in expressing your creativity with a unique handmade prom gown or you hope to save some money on this expensive purchase, you don't need a lot sewing experience to make your own prom dress. Choosing a simple dress pattern allows you to create a gown you can be proud of, while showing off your style with your choice of fabric, embellishments, and accessories. It is important to read the back of the pattern package to see which materials work best with the pattern you've chosen. The pattern envelope will suggest the type and amount of fabric, but you can choose the color and pattern from among those options. Make sure that you are familiar with the type of material you choose. 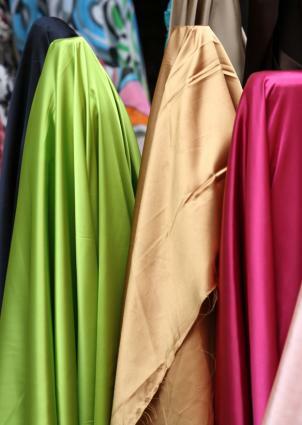 Satin and chiffon can run and fray, and they slide around as you work. If you're set on one of these fabrics, talk to the associates at the fabric store for tips and consider getting help from an experienced friend. If you choose velvet fabric, be sure to match up the nap, or the way the fuzzy part leans. Both pieces should have the nap going the same way when you get ready to sew. You'll need more fabric for this reason, since you'll have some waste when you're cutting out the pieces. For print fabrics, be sure to match up the print whenever possible. This can seem tricky, but it really only involves paying attention to the seam allowance mentioned in the pattern and cutting your pieces so they match when the seam allowance is used. Try to get a continuous pattern, even across a seam. Always buy extra fabric. Your pattern will tell you how much you'll need, but add at least one extra yard. This may seem like a waste of money, but you'll be glad for the extra if you make a mistake. Often, when you go back to the fabric store, they may be cutting off a different bolt of the same fabric, resulting in a slightly different color. If you don't have all of these supplies, you can easily find them at your local fabric or craft store. Before you begin cutting out your pattern pieces, you'll need to make sure you have the correct measurements. Although you may know your dress size, it's best to follow the size guidelines listed on the back of your pattern. Sometimes, patterns are sized larger or smaller than your regular clothing. This is especially true if you're using a vintage dress pattern. Put on the undergarments you'll be wearing with your dress. If your bra has padding, make sure you are wearing that bra when you measure. Measure your bust at the fullest point, over the top of your bra. Measure your waist at the narrowest point, usually about an inch above your belly button. Measure your hips at the widest point. Take any other measurements requested by the pattern. Compare your measurements to the table on the back of the pattern. You may be between sizes. If so, choose the larger size. You can always take the dress in a little if you need to, but it's much harder to let it out. Follow the directions on the pattern exactly. The directions will tell you where the folds of the material should be and how to lay the pattern on the bias. It's extremely important to transfer all the lines and directions you see on the pattern pieces onto the fabric itself. 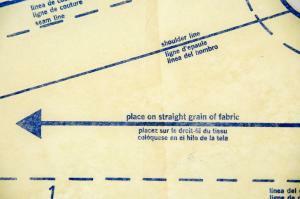 These lines and directions will tell you how to assemble your dress. For best results, arrange your pattern pieces on the fabric starting in one of the corners. That way, you can minimize waste. After all of the pieces are arranged correctly, use sharp scissors to cut the pieces carefully. The sharper the scissors, the less chance you'll make an uneven cut that could cause problems later. Don't skip any of these steps mentioned in the pattern. Even if you think you know what's next or have a better idea for the order, the steps are arranged the way they are for a reason. Take your time when sewing a prom dress. Rushing a project can lead to mistakes that are time-consuming to correct. Be sure to use the appropriate thread for the project and use the best needle setting for the material you are working with. The pattern will specify these requirements. It is important to check the fitting of your gown throughout the sewing project. Check sleeves (if any) to make sure they aren't too tight before sewing them onto the dress. When sewing the bodice, be sure the bust isn't too tight and that it falls at your natural waist. When you're ready to hem your dress, try it on with the shoes you will be wearing to the event. Then you can adjust the length accordingly. Although using a pattern takes care of the basic design for you, you can always add your own personal stamp with your choice of fabric and embellishments. Express your unique style with a dress you made yourself, and rest assured that no one else at prom will be wearing the same gown. You never know; this sewing project may even launch your career as the next great fashion designer.